Add a little fancy to your summer table top with select items from vintage bird cake stands to colorful paper trays for entertaining. We love this Large Pedestal Bird Cake Plate from Wendy Addison. It’s Victorian/Vintage inspired beauty is enhanced with soft colors and hand-drawn calligraphy. Measures 8.75″ around. The best part is it has a matching Cloche (sold separately) for a striking table top piece. 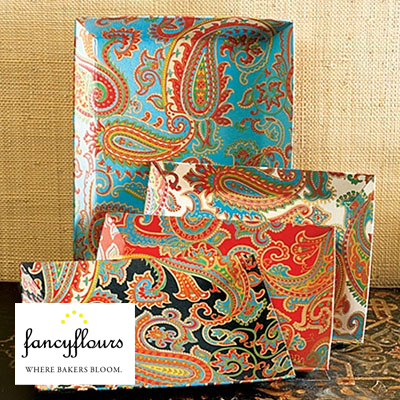 These Red Chic Paisley Decorative Trays made from recycled cotton paper make a marvelous presentation for a special gift, or a very colorful platter for a summer picnic. They come in a set of 2 trays (large and small) and are also available in black, white or blue background. Whether you are looking to store cookies, cupcakes, cheese or savory pastries this lovely pair of exquisitely designed Cafe Flore™ Plateau Cloches is a stylish and wonderful way to make a statement. Browse our What’s New TableWare and What’s New Paper Ware for our complete collection of items of summer!